S-Series slip ring -- long, trouble-free service. INSUL-8 has introduced its newly designed S-Series slip ring, ideal for passing communications, video or ethernet signals at rotating interfaces. This new slip ring is designed to operate as a stand alone unit, in combination with other Insul-8 power and control rings. It can be supplied unenclosed or alternatively in a sealed (IP56) steel housing. 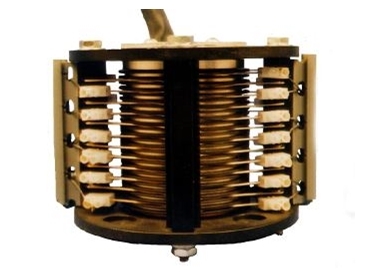 The slip ring is 38mm bore, and the unique compact design provides one ring per 3mm, up to a maximum stack of 115 units. It features silver plated brushes (99.99% pure silver), a contact resistance of 0.00025 ohms and a signal to noise ratio of 31dB. Maximum rating of 5A 250V, ac or dc. The S-Series slip ring provides long term, trouble-free service.